Paul Volcker resigned from the Obama administration today as another member of the staff abandoning the Titanic before it sinks into oblivion. 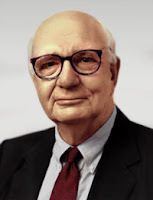 Volcker was our Federal Reserve chairman from 1979 to 1987. When the history books are written years from now he will go down as an American hero. He stepped in during the late 1970's in a period of high inflation and low economic growth (stagflation). While every politician and member of the business community begged for him to lower interest rates, he raised them non-stop up to 18% to crush the back of inflation. He put the economy into recession with the high interest rates and cleansed the system of the current mal-investments in place. Real estate prices fell, stocks fell, companies went out of business, and politicians were not re-elected. Today we have the exact opposite situation under our current Federal Reserve chairman. Our politicians and banks beg him for low interest rates and bail outs and he provides it at every opportunity. He purchases the toxic debt from the banks, and he purchases unlimited amounts of government debt so politicians have an unlimited credit card. This is the equivalent to giving a heroin addict an increasing amount of heroin when they begin to sober up. The party never stops, and the system is never allowed to cleanse. Until the heroin addict dies from an overdose, which is on its way in the form of a currency crisis. Volcker was the most hated man in America during the early 1980's, just like a parent who punishes their children for misbehaving. 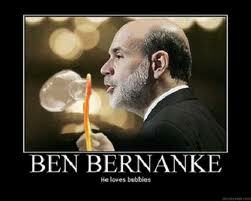 Bernanke is the exact opposite. He is beloved by Americans today for providing never ending stimulus and "saving" us from the depression. 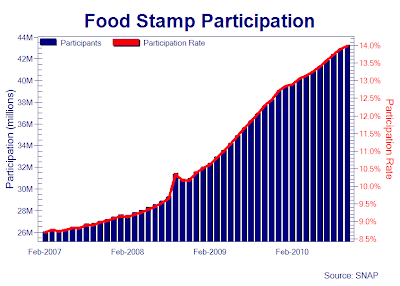 However, as Milton Friedman once said, "There is no free lunch." Thank you for your service, Mr. Volcker, I wish we had a courageous leader such as yourself running our Federal Reserve today. The fundamentals for the apartment sector continue to improve. Rents are slowly rising across the country, and according to Reis vacancy rates fell in the fourth quarter from 7.1% down to 6.6%. As Americans continue to lose their homes to foreclosure they are moving into apartments as a transition. Yesterday Trepp reported that the delinquency rate for mortgage backed securities for apartments rose to 16.8%, setting a new record high. Most of these are loans that were created and packaged during the peak of the real estate bubble back in 2006 and 2007. This trend will also continue, meaning distressed properties will continue to enter the supply stream as the fundamentals of the market continue to improve with our country's population growth and limited new apartment construction entering the market due to the inability to finance projects and record high supply already in place. The distress on the financial side of the market should continue and peak sometime between 2012-2014. As interest rates rise, it will continue to push property prices down. This morning the ADP posted an extremely positive reading, sending already bubble levels stock prices even higher. However, some market participants (me) looked at the ADP report with some skepticism. Another piece of economic data released today was the ISM Services Employment Index. The following chart shows how these two pieces of economic data have tracked each other essentially tick for tick over the last decade. The ADP Employment data surged, while the ISM employment index fell significantly creating the separation shown below. This has me concerned on the reliability of the ADP data. It appears nothing will stop the stock market freight train, until something does. Then look out below. Before we get started with the look ahead to the new year, I would first like to thank the people who continue to visit and read this website. My viewership has grown significantly since the launch back in August 2008. For the newer readers, I will provide a quick overview for who The Tuna is and why this site was created. My business work on a day to day basis is in the realm of real estate. 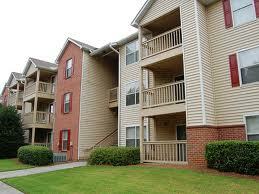 I manage a 460 unit apartment community as a full time job, and I work on other real estate projects in my off hours. If you have read this site for any length of time you know that I am more negative on real estate and its near term potential than just about any other asset on the planet. This is the reason I work in the industry. My goal is to be as prepared as possible to take advantage of the coming real estate investment opportunities when prices fall to attractive investment levels. While my personal portfolio over the past five years has been composed of close to 100% silver and silver related assets, I have never owned a property or real estate related investment of any kind. I read close to 50 business books a year by text or audio. (Kindle and Audible) I listen to over 300 hours of financial radio a year, (Financial Sense and King World News) and I occasionally take the television off mute to listen to commentators on CNBC which streams in my home close to 24 hours a day. Most of this information stays bottled up inside me, and the rest spills over onto this website. This allows me to help digest what I've learned as well as help others that may need more clarity on what is happening in the financial world around them. The incredible success of personal portfolios that have exploded in value based on the outlook provided here makes me far happier than any paycheck I have ever received at a job. So with that, I look forward to another exciting and fast paced year in the markets ahead of us. The financial world is changing with lightning speed and the entire paradigm used by anaylsts has become outdated moving forward. The following is an overview of the biggest stories of 2011, and ends with my personal financial recommendations for investments in the year ahead. Before August 1971 the world was on a gold standard. When a country ran a trade deficit, in order to pay their bills they were forced to sell their gold. When the gold was gone, the party was over, and they were forced to become a net exporting country through a focus on manufacturing. This was occurring with the United States through the late 1960’s as our gold was rapidly leaving our vaults. The US was faced with an oncoming “default” which was how it was known at the time as foreign countries would only accept payments in gold. In August 1971, the United States made a landmark decision when we decided we would no longer play by this rule. We left the “gold standard” and our currency, and every other currency in the world, was now backed by nothing. This is the first time in history every currency in the world had no gold backing. This created a 37 year boom that allowed a country (the United States) to run endless deficits that could not exist under the previous gold standard. This new form of deficit spending allowed the government and our central bank to “smooth over” any problems the economy faced. In the 1980’s they created a boom through Reagan tax cuts that were financed with an explosion in our federal deficit. In the 1990’s Alan Greenspan of the Federal Reserve cut interest rates creating an explosion in the money supply. In the 2000’s we had a combination of both. George Bush cut taxes that were financed through massive deficit spending, and the Federal Reserve cut interest rates to record lows creating a massive explosion in the money supply. This environment created a world of booms and busts, where the previous stimulus created the next boom and then the subsequent bust, which was followed by the next stimulus. This process continues today. The financial crisis of 2008 was due to the massive stimulus provided after the stock market crash of 2000. In order to face the 2008 crisis, our leaders have used the same prescription although the new strategy has been put on steroids. President Obama took our record setting annual deficit from $460 billion up to $2 trillion in order to stimulate growth. We continue to run $1.5 trillion deficits annually as a means to fight the economic slowdown. The Federal Reserve has taken interest rates down to zero, and has now embarked on what is known as Quantitative Easing where they print money to purchase various forms of debt in order to keep interest rates low. This strategy put a bottom to the economic downturn in some ways in March of 2009, and since then parts of the economy have been in continuous slow growth. Other parts of the economy such as real estate, employment, and consumer spending continue to stay in a depression which began in December 2009. In the face of every economic downturn over the past 40 years of global fiat currencies, governments had the opportunity to cleanse the system of the excess by allowing banks, companies, and investments to fail. They were faced with this decision during the financial crisis of 2008, and they decided not to take the medicine. Instead of allowing the losses on the banks balance sheet to be cleansed, they nationalised the banks and put the losses on the backs of their country’s tax payer. When this decision became clear during the week of the AIG and TARP bail outs of over $1 trillion, which was echoed by various governments around the world with their subsequent bail outs, the next crisis became crystal clear. The sovereign debt of governments around the world would not be able to support both the toxic balance sheets of the banks as well as the already bloated debt they were currently encumbered with. There would be a day of reckoning when the countries were unable to pay, bringing the next global financial crisis. The only question at the time was: When? During the financial crisis the first sign of trouble came in the form of a California subprime mortgage broker named New Century who shocked the world by shutting their doors due to surprising massive losses on their darling subprime loans. This was the first domino in a chain that led to two massive Bear Stearns hedge funds failing, the credit shock waves during August 2007, Bear Stearns failure in February 2008, Indy Mac, Countrywide, Fannie Mae, and Freddie Mac failing in the summer of 2008, and Lehman brothers bankruptcy followed by the collapse of the financial system in the fall of 2008. When New Century failed and the first domino fell, most analysts could not imagine, never mind predict, the contagion that would subsequently spread over the next 18 months. Because the same set of dominoes are currently falling in real time as we move through the next crisis in sovereign debt. Let’s discuss where we’ve come so far, and this will bring us to where we go from here. In the fall of 2009, the city of Dubai shocked the world (sound familiar?) by announcing that they would be unable to pay their debts without support from near by governments. 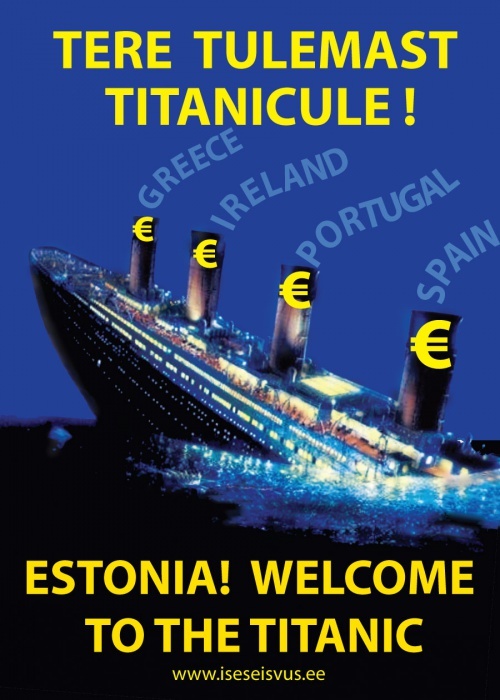 They received the bail out package they needed, but their trouble set the stage for the coming sovereign debt storm. 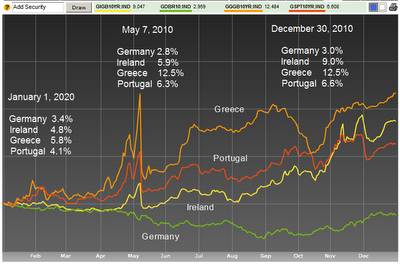 Six months later in March of 2010, credit spreads began to blow out for the government of Greece as investors began to understand that it would be impossible for them to service their debts. A bail out packaged was put together soon after to temporarily quell the nerves of investors and stave off a national bankruptcy. Only a few months later Ireland found themselves in the same situation as investors began to “run” on their debt and interest rates began to skyrocket. Their bail out package was announced a few weeks ago, and investors have once again found themselves in a state of complacency that the worst is behind us, and the sovereign debt crisis is contained we as move into 2011.